My hubby and I have been busy making travel arrangements for a trip to visit with our son in Spain. My concentration seems to be shot since we've been busy with passports and trying to get everything organized. I wanted to paint a village scene but one little shop is as close as I could conjure up. I will be listing this 9 x 12 painting on eBay this evening. Bright and early Monday through Friday, Caitlin arrives at her cakery where she whips up some magic with secret ingredients to enticing confections. She turns on her favorite 40's music station and sways around the kitchen in her red dotted apron mixing gooey goodness as she waits for the ring of the bell announcing her first customer of the day. She greets each patron with a smile and sugary samples as she pours steaming cups of coffee while they make their choices reading from the huge menu written daily on the chalk board behind the counter. 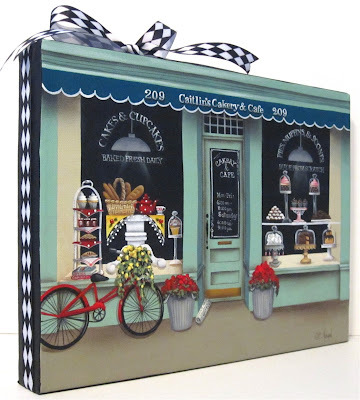 Desserts are displayed like exquisite jewelry in the windows and the scent of baked goods greets each hungry soul who enters this little cakery heaven at 209 Main Street. Since my mind has run amuck, I will be painting little cupcakes, for a while until the fog clears. 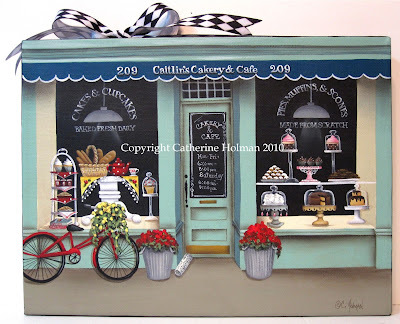 Don't you wish you could step through the door of this shop and order a coffee and dessert then sit down at a table while you browse through a recipe book on cupcakes! 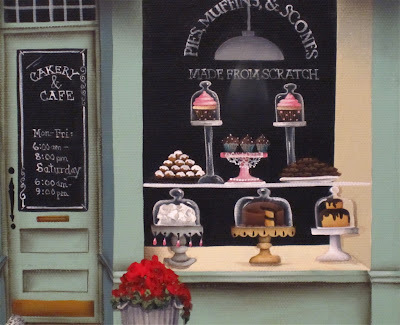 gorgeous painting as always Cathie!!! Cathie, absolutely gorgeous!! I love everything about this painting! This has to be one of my favorite Catherine...I could just step right through the doorway and order some goodies. Great work. boy Caitlin has long hours. Great painting. So enjoying your work. Have a wonderful time in Spain. I guess there is an up side to kids moving to other parts of the world. Love it mom!!! I love all the little details and I now I want some cake! In answer to your question, yes, I do wish that I could step right into this delightful and enticing little shop. The stories that go along with your paintings are almost as delightful as the paintings themselves. It is perfect and it makes me so hungry to look at that yummie cakes (lol). Dera Catherine today is my 1. blogaversary. I am having a giveaway, and I would like you to join it. This just may be one of my all time favorites!! I would love to have a cup of coffee in that cafe. What a wonderful painting, Catherine. What a lovely painting Cathie! I feel like I could walk through the door and have a cup of coffee and a little goodie! So charming and, yes, I want to go in and have a jewel like confection. I can't imagine what a trip to Spain will do with your art...it's going to be interesting to find out! I have a new favorite! That is just so beautiful. I can just picture the people mingling inside. Really like this one especially the vintage red bicycle with basket of flowers-- just says "spring" to me!!! 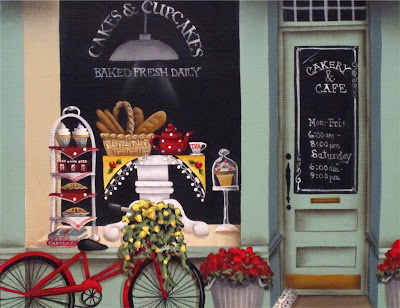 I like the cupcakes you paint but this one with the bike and basket of flowers just is "special"!! !